Quagsire in game: 563 Who? Important notice! Pokemon Quagsire is a fictional character of humans. Quagsire first appeared in Once in a Blue Moon. It stole the GS Ball from Ash for a festival. A Quagsire has also appeared in Training Wrecks, under the ownership of Rocky. Quagsire battled Ash's Pikachu and Grovyle, alongside a Walrein. Before Pikachu could nail Walrein with its Electric Attacks, Quagsire would protect Walrein from being shocked, due to its immunity to electricity while Walrein's Ice Ball hit Grovyle and Pikachu hard, but after the Ice Ball went slower every turn, Pikachu and Grovyle defeated Walrein and Quagsire. A Quagsire made an appearance in Like It Or Lup It!. Crasher Wake owns a Quagsire, which appeared in A Crasher Course in Power!. Multiple Quagsire appeared in A Faux Oak Finish!. Multiple Quagsire appeared in Defending the Homeland! and Beyond the Rainbow! as Pokémon that lived in the wetlands that Ash's Goodra was from. One reappeared in Master Class is in Session! and Performing a Pathway to the Future! to watch Serena's performance with the rest of the wetland Pokémon. They appeared once again in A Diamond in the Rough!, and XY139 when Ash and his friends returned to the wetlands. Three of them appeared again in the following episode. A Quagsire was one of the Pokémon seen at the Pokémon Swap Meet in Tricks of the Trade. Five Quagsire were among the Pokémon competing in the Fire and Rescue Grand Prix in The Fire-ing Squad!. A female Quagsire also makes an appearance in Love, Totodile Style, where Ash's Totodile fell in love with her at the end of the episode. Lisa had a Quagsire in Spell of the Unown: Entei, and used it to battle Ash against his Pikachu. After Pikachu landed on the head of Lisa's Quagsire head first, both Pokémon fainted. A Quagsire appeared in The Wayward Wobbuffet swimming in a river when it encountered Jessie's Wobbuffet which got lost and gave it directions. 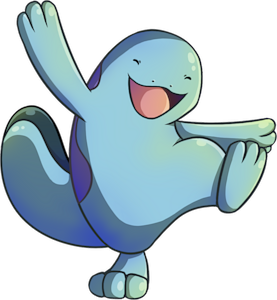 A Quagsire was one of the Pokémon competing in the Pokémon Sumo Wrestling in Ring Masters. A Quagsire also appeared in Celebi: Voice of the Forest. Three Quagsire were among the inhabitants of an oasis just for Pokémon in Got Miltank?. A Quagsire appeared in Dueling Heroes. A Quagsire was one of the feuding Pokémon at Professor Oak's Laboratory in Bulbasaur... the Ambassador!. A Quagsire was seen at a Pokémon Center in The Legend of Thunder!. Multiple Quagsire appeared in Pokémon Heroes: Latios & Latias. Also, another one was used by a competitor in the Tour de Alto Mare. A Quagsire was seen training alongside its Trainer in You're a Star, Larvitar!. Jackson uses a Quagsire in his battle against Macy in Tie One On. A Quagsire appeared in the opening of Lucario and the Mystery of Mew. DP139 Quagsire Ash's Pokédex Quagsire, the Water Fish Pokémon. Quagsire has an easy going nature and doesn't care if it bumps its head on boats and boulders while swimming. Quagsire first appeared in Off Course with Corsola where it is seen as one of the Pokémon Crystal captured and sent to Professor Oak via the Portable Transfer System. She remarked that she found it on Route 32 and was "a tad stronger than I expected." 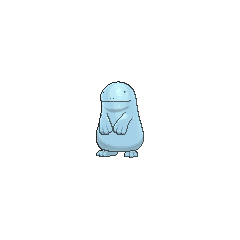 A Quagsire was one of the Pokémon sent to help the fight in Ilex Forest in The Last Battle XIII. Much later, Crasher Wake is seen in possession of a Quagsire, and uses it to defeat Platinum's Empoleon before falling to a Giga Drain from Diamond's Torterra, Tru (which Platinum borrowed after she was unable to catch a single grass Pokémon in the Great Marsh). This won Platinumthe match. Pokémon Mystery Dungeon: Gates to Infinity: Quagsire appears as the landlord of Paradise as well as an important character in the storyline. The player's partner buys land from him at the beginning of the game that would become the headquarters for the player's exploration team. He also runs an area similar to the Chimecho Assembly from the previous games. Like some members of Wigglytuff's Guild, he has a catchphrase, which is "hmm". He is also responsible for dealing with captured outlaws, much like Magnezone before him. He is known to be a hard taskmaster to these Pokémon. 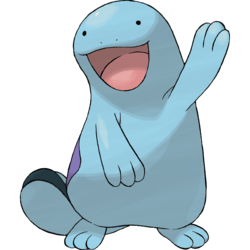 Despite Quagsire's Pokédex entry from Ash's Pokédex in Once in a Blue Moon stating that Quagsire live in fresh, clean, drinkable water, Quagsire appear in the Great Marsh and Route 212, both marshy areas. Wooper and Quagsire are the only non-Electric Pokémon that can learn Eerie Impulse.